In the Wake of 9/11: Did George W. Bush have a Grasp of Key Foreign Policy Issues? America is preparing for war [late September 2001]. British and US Special Forces “trained in the arts of kidnapping and assassination” are already operating inside Afghanistan. More than one million US troops are on standby. US military bases around the World are on high alert: “the Japan-based USS Kitty Hawk battle group and the 7th Fleet are ready to join” in the largest display of military might since the Vietnam war. The Bush Administration is planning on launching this military operation without delay, prior to the development of a cohesive anti-war movement in the US and around the World. Already, US military personnel of the 82nd Airborne and 101st Air Assault Divisions have arrived in Pakistan. They will be collaborating with the Pakistani military and the Inter-Services Intelligence (ISI), the agency which over the years –under CIA guidance– has channeled support to the Islamic jihad including Osama bin Laden and the Taliban government in Kabul. The pretext to wage war as a means of combating international terrorism is totally fabricated. In a cruel irony, the legitimacy of the Bush administration in embarking on this military adventure rests entirely on Osama bin Laden’s presumed role in the terrorist attacks of September 11. …on too many issues, especially those dealing with the wider world of global affairs, Bush often sounds as if he’s reading from cue cards. When he ventures into international issues, his unfamiliarity is palpable and not even his unshakable self-confidence keeps him from avoiding mistakes. A president with minimal understanding of key international and strategic issues can easily be manipulated by the military-intelligence apparatus. 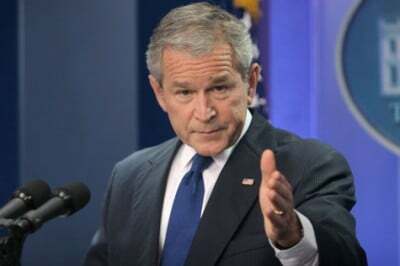 Apart from reading carefully prepared speeches, is George W. Bush as President and Commander in Chief capable of formulating “responsible” foreign policy decisions? In this regard, does the President wield real political power or is he an instrument? In other words, who decides in Washington? On the eve of a major military adventure, this question is of utmost significance because ultimately the US military machine will respond when the president “pushes the button”. The knowledge of the President on Pakistan and Afghanistan –i.e. the two countries which constitute the theatre of America’s war– is dismal to say the least. Prior to becoming President, George W. Bush thought the Taliban was a rock group. In a 1999 TV interview with Andy Hiller on NBC (WHDH in Boston), when asked who was the president of Pakistan, George W. Bush had “the name of General Pervez Musharraf on the tip of his tongue, but then allowed his enthusiasm to make him appear to condone the military coup that ousted the elected prime minister, Nawaz Sharif.” (Daily Telegraph, 6 November 1999). Hiller: “And it’s . . ?